The first thing that I do when performing any type of Windows Images, is to take my time preparing an isolated environment with all the tools I want. In this section, we will be working on the ADK machine. ADK machine is a non-domain joined machine without any security baselines or antivirus or security solutions installed on it. Why this is important? This is not a requirement from Microsoft, but it is the way that I find very productive and reduce the possibility of errors. The need to have the machine without antivirus, can prevent offline image servicing errors. When the machine is not joined to the domain, then it will reduce the possibility of a restriction from GPO that can interfere with DISM commands that heavily access the file system and do complex stuff. After long time doing imaging, I found this way working well for me. ADK machine is a Windows 8.1 machine, not joined to the domain, does not have any security products or antivirus installed, and has Microsoft ADK installed on it, hence the name ADK machine. ADK stands for Assessment and Deployment Kit. Those are tools that can help you to deploy Windows in unattended way. 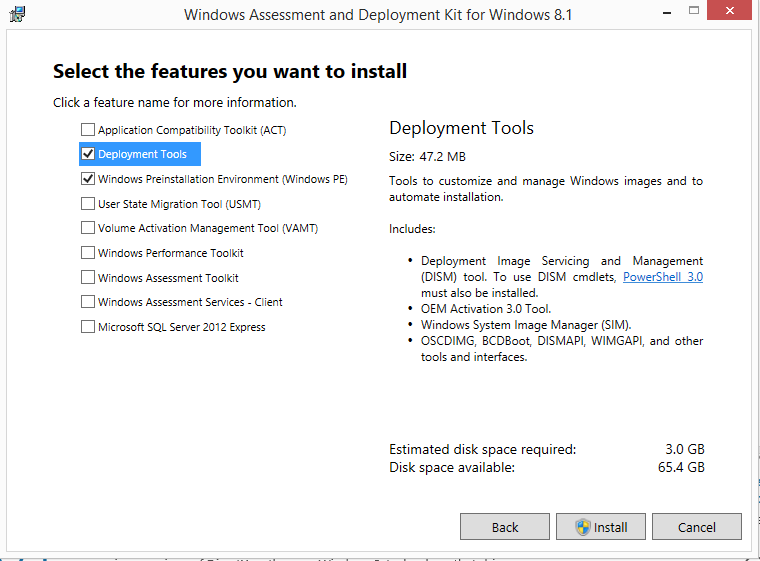 Make sure you install the ADK version that supports Windows 8.1. Make sure to download the ADK and save the installation files in your file server as you may need to reinstall it. Tip: I usually use a virtual machine for the ADK machine. I install Windows 8.1 on it and ADK for Windows 8.1, and I take a snapshot immediately after that with the name (ADK machine clean). You will find this handy when troubleshooting offline image servicing and the need to revert back to clean ADK machine state. I prefer to have a virtual machine with 4 GB RAM (2 GB is possible), normal processing power and one system drive c:\. The C drive should be big enough to hold all imaging operations, so make sure you have at least 60 GB drive size. 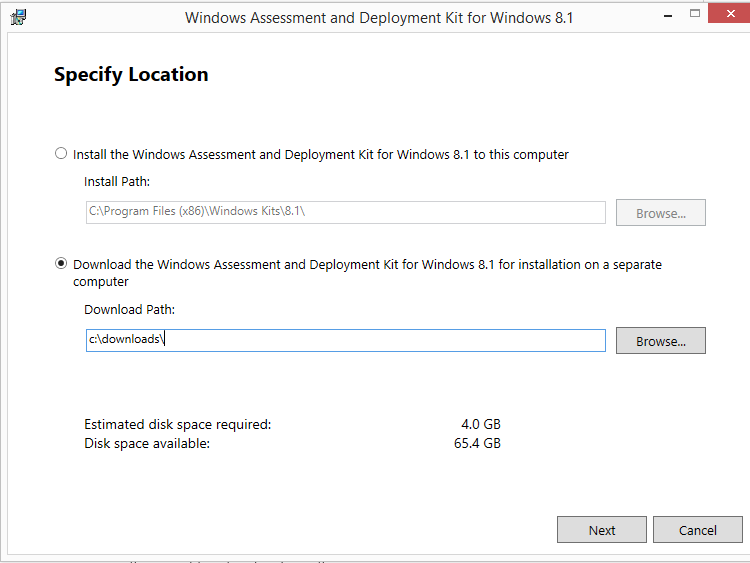 Get your hands on the Windows 8.1 installation files, and place them under C:\Software\Windows 8.1 Installation folder on the ADK Machine. I highly recommend here to take a snapshot on the ADK machine after you have installed ADK, name the snapshot something like (ADK machine clean). We are still in the ADK machine. 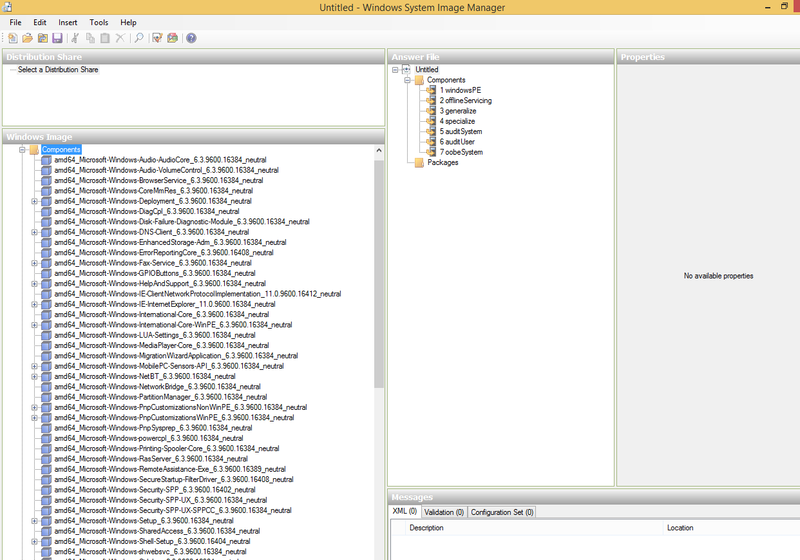 Now go to Start > Windows System image Manager. You will get a warning that a catalog need to be created, click OK.
Now, under the “Answer File” window, right click and choose “New Answer File”. Once done, this will show a template for a new answer file. Windows Image Window: contains settings that you can pick from and add to the answer file. Answer File Window: contains an answer file to be populated with settings. Properties Window: contains the sub settings for a highlighted setting in the Answer File Window. If interested, checkup the below link for information about all settings available under the “Windows Image” window. I have configured many settings in the answer file, so I will show you how to configure one setting with screenshots, and you will get the idea, then I will list the settings that I have added and you can do the same. 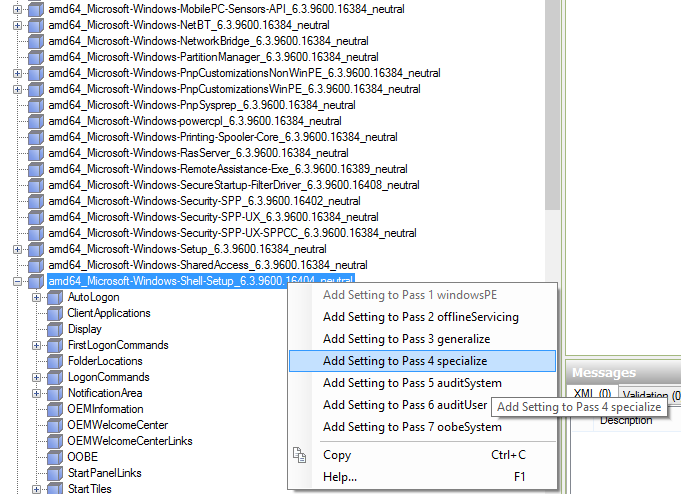 In the “Windows Image” window, expand “Components” and search for “….Microsoft-Windows-Shell-Setup_……._neutral”. Right click the setting and click “Add setting to Pass 4 specialize”. This simply means that we are adding a setting that will specialize the image. Now look at the “Answer File” window, and expand “4 specialize” folder, and you can see the setting that we have added in the previous step. Click on it, and notice the “Properties” window at the right. Click “Copy Profile” in the “Properties” window and choose “true”, and also in the “TimeZone” setting, write down the time zone that you wish. In order to learn how to type the correct format of the time zone, check the URL mentioned previously. CopyProfile: the most important setting, this will give us the chance to customize the profile of each user using the image. HideOnlineAccountScreens: this will remove the option to log on using Microsoft account during installation wizard. Finally, after adding all those settings to the answer file, go to Tools > Validate Answer File. Make sure you do not have errors, and then save the answer file as CopyProfileunattend.xml. Great guide – helping me set up some reference / project machines. 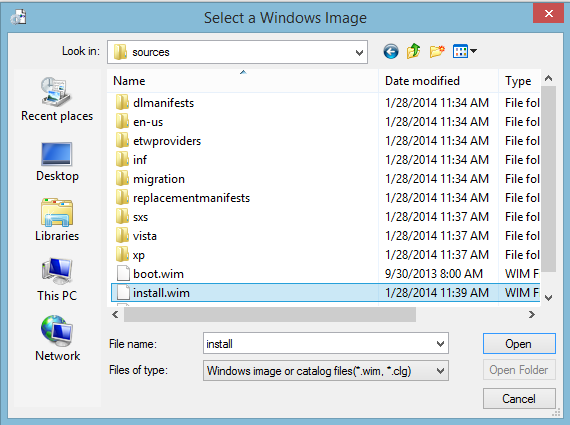 ‘C:\Software\Windows 8.1 Installation\Sources\install.wim’ file come from? Is this from the Reference machine created in the later steps? All the documentation I’ve read about the HideOEMRegistrationScreen setting is that it hides the “OEM Registration Screen,” whatever that is. Exactly what part of the Windows Welcome Screen does HideOEMRegistrationScreen hide?